India's PM Tries To Reassure Country Over Rupee's Slide : The Two-Way The leader says he believes the currency, which has fallen by 15 percent since May, is undervalued, but that the drop doesn't mean the economy is 'going down a hill'. Indian Prime Minister Manmohan Singh during a diplomatic signing ceremony with Iraqi Prime Minister Nouri al-Maliki in New Delhi last week. India's Prime Minister Manmohan Singh addressed a steep slide in the country's currency in recent weeks in a rare public speech on Friday, hoping to assuage concern over the rupee's sudden depreciation and blaming the opposition for inaction in Parliament that he said was sending the wrong signals to the markets. "There is no reason to believe that we are going down the hill," said Singh, a veteran economist who has been prime minister for nearly a decade. 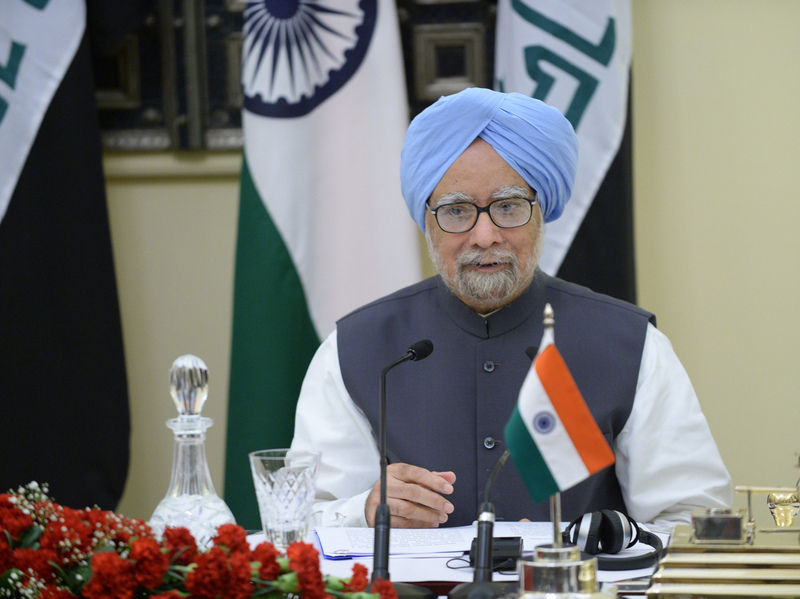 They were Singh's first remarks since the rupee began tumbling in recent weeks. As he attempted to soothe worries over the economic crisis enveloping Asia's third-largest economy, the rupee staged a mild comeback on Friday, having lost fifteen percent of its value since May. Singh said he believed that the country's currency had slipped below its true value. But he said the depreciation also had an upside. "To some extent, depreciation can be good for the economy as this will help to increase our export competitiveness and discourage imports," he said. Singh said the rupee's slide was due to the expected winding down of the U.S. Federal Reserve's monetary stimulus which has pumped cheap money into the wider economy, including emerging markets such as India. Foreign investors have pulled their money out of India in recent weeks in anticipation of the Fed's tapering, which would signal a renewal of the U.S. economy and thus make it a better bet for investors. Singh said Indians need to reduce their $50 billion a year gold-buying habit, which drains foreign reserves and ties up assets in a non-productive holdings. He repeated a mantra of his government, saying, "We need to reduce our appetite for gold." Singh lashed out at the opposition BJP party, which he accused of hurting investor sentiment by repeatedly disrupting the work of Parliament. The 80-year-old prime minster also mildly admonished rich countries, hinting that the U.S. Fed's move should think of its impact on the rest of the world. "In a more equitable world order, it is only appropriate that the developed countries – in pursuing their fiscal and monetary policies – should take into account the repercussions on the economy of emerging countries," he said. Singh — who as finance minister was the architect of an overhaul of the Indian economy in the 1990s that helped the country become an international powerhouse — emphasized that there was no going back. He said the government was not going to impose controls or reverse its reforms. But some of those reforms are costly. A food security program proposed on Monday would provide huge food subsidies in the form of wheat, rice and coarse grains – some 800 million people would be eligible for the program. Its $20 billion price tag sent markets sharply down over worries of India's rising fiscal deficit. Moody's said that the measure will worsen India's economic imbalance and is a negative development for the country's sovereign rating.